There were so many fabulous introductions at the market this spring. Color was just about everywhere at Market. 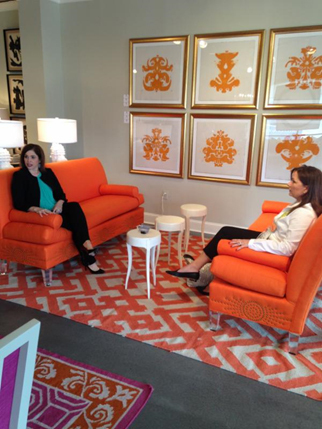 Tobi Fairley’s new furniture collection captured my love of color! It had exciting & colorful upholstered pieces, a luscious blush leather bench, fabulous fuscia florals, and lipstick red leathers. Her collection was fun and feminine! Check out this funky bead chandelier… talk about a pop of color! My VIP tour buddies and I loved these orange banquettes. Not only were they extremely comfortable, but the bolsters are removable. This way, you can seat more people or buy extra so each person has their own armrest! How about this combination of purple and green? I’d love to see this in a sitting room or sunny conservatory. Thibaut’s fabrics were spectacular, like this lovely floral upholstery. It’s so feminine! This gorgeous table from Ambella was also a real showstopper! Florals are making a comeback, and not just because it’s spring. Draperies, upholstery, wall art…flowers were everywhere at Market. One of my biggest finds was Ambella Home. Their pieces were fantastic, like this curvy sofa with the floral branch stretching across the back. Check out the applique detail on the chair and the apron of the ottomans. It’s exquisite! Gold and brass are replacing the darker, oil rubbed finishes that have been so popular. Bernhardt was showing several pieces of “feuille d’or” or gold leaf. This cocktail table is stunning. And so is this beautiful dresser with golden drawer pulls accessorized with gold lacquer boxes. 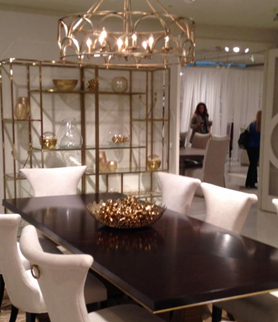 Gold accessories and lighting added a luxe feel to practically all the showrooms.